As far as the world-building is concerned, THE AWAKENING: AIDAN by Abby Niles is very creative, very unique and romantically dark. ANiles created a very distinct world where love plays a great part in a Were’s existence and well being. In layman’s retelling, once a were finds his mate and his beast claims the other person, were or human, as their mate, their life source is immediately connected to them. Once that connection is severed either through death or an unfortunate break-up, the were is no longer capable of being romantically involved or bond with another person and in extreme cases, they risk going through catatonic depression. And such is the case with Liam, Aidan O’Connell’s best friend and roommate. After Liam revealed his true nature to his human girlfriend, she bolted and Liam was left with not only a broken heart but a broken soul as well. He’s going through deep depression which prompted Aidan to hire Jaylin Avgar, one of the very few therapist who studied and trained to treat this rare were condition. Turns out Jaylin is Aidan’s mate but as the former is jaded about were human relationships and is skeptical on how deep the mating goes, Jaylin did her best to avoid Aidan and run away from what she deems as a gruesome fate. Fortunately, Aidan is very persistent and managed to convince Jaylin that inasmuch as her percception about mating is valid, she failed to see the bliss of such pairing can give her. And they lived happily every after. Except I didn’t. Not exactly. 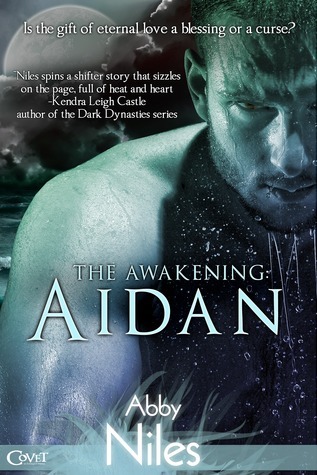 Right off the bat I found THE AWAKENING: AIDAN depressing because ANiles showed us the downside of losing a mate. Liam’s bouts of catatonia made me want to go into depression and zap myself to wakefulness simultaneously! Because of this side story the entire novel felt overcast and I really struggled as far as rooting for Aidan and Jaylin because I totally see why Jaylin wants to run in the opposite direction! There’s grieving but being a love zombie is a totally different thing. As for the characters, I admire Aidan’s loyalty to Liam and his determination to win Jaylin over and make her see that he is The One for her. I like how Jaylin is so rational and stubbornly self-preserving, seeing Liam would make anybody think twice before agreeing to mate with a were. Despite Aidan's elaborate courtship, I didn't feel the chemistry between these two. On a primitive level these two are a definite yes but on a human level, I didn’t really feel the exhilaration of a brand-new romance. Verdict: The world-building is great, the romance was average. In hindsight, if I didn’t meet Liam and saw his disheartening condition, I might have enjoyed THE AWAKENING: AIDAN. Or if ANiles told Liam’s HEA instead of Aidan’s, I think that would’ve made a more cohesive and interesting story. ANiles created a too strong of a character in Liam that he overshadowed Aidan’s HEA. Great review. I liked it but had a hard time understanding the whole mating bond she created. For me I felt like I was learning like they were and still do not 100% undertsand it. I would of prefered a dictionary in front or back instead.